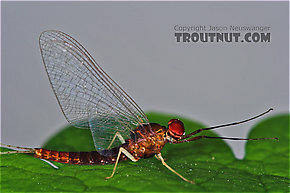 Like most common names, "Great Red Spinner" can refer to more than one taxon. They're previewed below, along with 15 specimens. For more detail click through to the scientific names. These are sometimes called Great Red Spinners. This species (or rather group of subspecies (Subspecies: Entomologists sometimes further divide a species into distinct groups called subspecies, which have two lower-case words on the end of their scientific name instead of one. The latter is the sub-species name. For example, Maccaffertium mexicanum mexicanum and Maccaffertium mexicanum integrum are two different subspecies of Maccaffertium mexicanum. 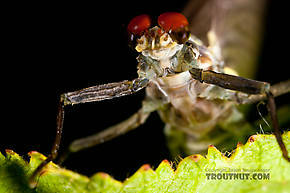 )), together with Drunella doddsii, make up the famous Western Green Drake hatches. They are widespread throughout the vast Western region and can be abundant enough in many locations to provide world class angling. It hasn't been all that many years since Western traditions and entomological "facts on the ground" began to influence the angler's lexicon heavily dominated by Eastern writers. Their initial reporting after visiting the region first popularized the phrase "Rocky Mountains answer to the popular Green Drakes of the East". This led to a false impression that lingers to this day. The reality is these giants of their family have abundant populations all over the West with no counterpart in the East, and the West does have abundant hatches of comparable Ephemeridae. 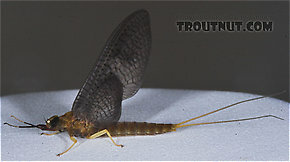 The Western tradition of naming outsized Mayflies "Drakes" is the reason for what many consider a misnomer by giving it the same common name as the legendary Ephemerid of the East and surely contributed to confusion for anglers unconcerned with such subtleties. 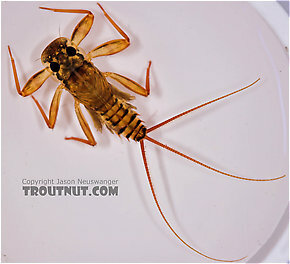 Female Drunella grandis (Western Green Drake) Mayfly Dun View 6 PicturesI collected this specimen while away from all my good photography equipment except the camera and one of my macro lenses, so I made do. The lighting is from lamps in a hotel room, so it was hard to edit for really true colors, but I tried to get as close as possible. 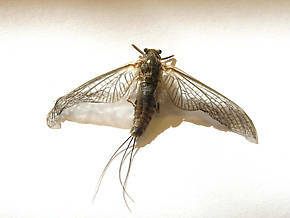 The body was 13 mm long, wing 19 mm long. These are very rarely called Great Red Spinners. 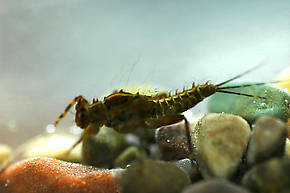 This species together with the Drunella grandis sub-species make up the Western Green Drake hatch. 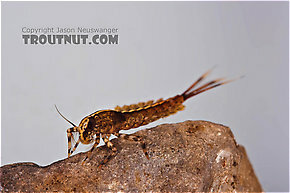 Besides being smaller, the adults are difficult to tell apart from it's larger siblings; but D. doddsi nymphs have a few peculiar traits that set them apart. 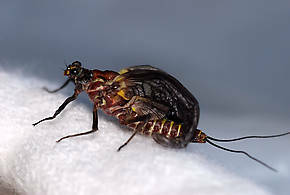 D. doddsi looks much thicker in the thorax (Thorax: The thorax is the middle part of an insect's body, in between the abdomen and the head, and to which the legs and wings are attached. 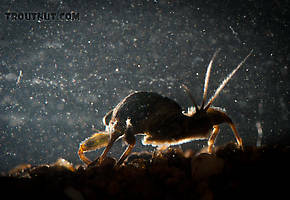 ), has a flat frontal head margin and a unique oval disk-like ring of hairs on its ventral (Ventral: Toward or on the bottom.) surface. 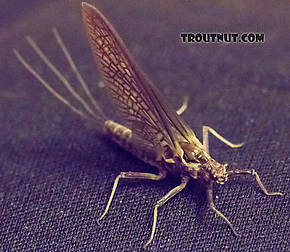 However, There are very few differences between the habits of these two species, and they are almost always discussed together in fly fishing books, so for many of the characteristics of doddsii, refer to the Drunella grandis page. The Brown Drakes are a favorite hatch of many in the Midwest, and they make a good showing on localized waters across the country. They are usually the first in a series of big drakes which bring large trout to the surface at twilight and into the early hours of the night.